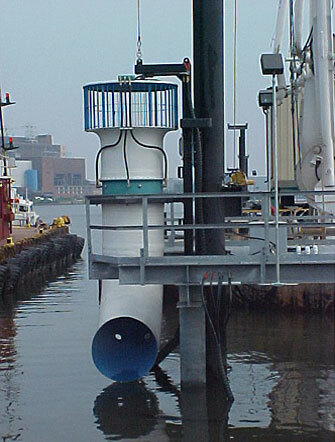 SedCon® Turbo Units are installed along the face of a dock, just above the mud bottom. During operation, a SedCon Turbo unit draws water into a bell-mouth intake and discharges it outward across the bottom as a powerful jet. The jet discharge keeps sediment in suspension by augmenting the speed of passing tidal currents. SedCon® Turbo Units operate in sequence with the tidal cycle, producing a series of overlapping jet flow patterns that prevent sedimentation in the berthing area.